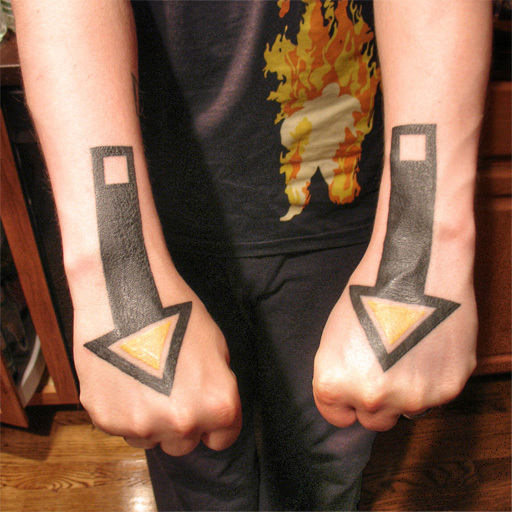 Here's a shot of the arrow tattoos on my arms, soon (a week or so?) after I got them. Co-worker of mine referred to them as a "Bold Statement", which seemed a little strange. Obviously, I'm showing off the work and I know they'll be seen, but mostly, they're very personal. I mean, I'm the one who sees them every day. That being said, it's impressive how quickly you can grow accustomed to something when you see it all the time. It's always a strange feeling, getting tattooed. The instant I feel that first prick of a needle, I have the clear resolve that a permanent decision has been made. An idea has become a tangible thing and will be with me forever, even though I can't rationally comprehend what "forever" means. There's enough permanent change we're subjected to. It's cool to actually control some.